The appearance of the eyes can dramatically impact a person’s facial appearance. 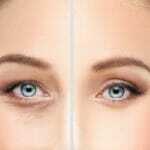 For example, wrinkles and bags under the eyes can make you look older, while puffy eyelids can make you look tired. Eyelid surgery and brow lift are two facial rejuvenation procedures that can help restore youth and beauty to the eyes and face. While these two procedures are different, it’s easy to confuse them because they tackle some of the same problems and offer similar benefits. Here, leading plastic surgeons Drs. Samuel Pearl and Alexander Ereso discuss the differences between the two procedures. Eyelid surgery aims to eliminate sagging, excess skin from the natural fold on the upper or lower eyelids. This procedure has become increasingly popular among patients seeking to restore youth to the eyes and face. Removing drooping skin from the upper eyelids can make the eyes look refreshed, while eliminating bulges or “bags” in the lower eyelids can shed years off a person’s appearance. Some people seek eyelid surgery for medical reasons. Loose skin hanging from the upper eyelids can make it difficult for someone to open the eyes and even interfere with vision. Eyelid surgery removes extra skin from the upper eyelid, allowing the eyes to open with ease. Sometimes, sagging eyebrows cause the upper eyelids to appear hooded, in which case a brow lift may be more appropriate. Brow lift, also known known as forehead lift or eyebrow lift, raises and reshapes the skin around the eyebrows for a younger, rejuvenated look. The procedure softens the deep creases and wrinkles across the forehead, and also reduces horizontal frown lines at the top of the nose and vertical lines between the brows for a youthful, refreshed appearance. Unlike eyelid surgery, brow lift can increase the distance between the lateral brow and upper eyelashes. Now that you know about the two procedures, it’s time to review your options. If your eyebrows are in good position but the skin on your upper eyelids is hanging, you may need upper eyelid surgery. If you have drooping eyebrows, try raising them to see if there is any extra skin in the upper eyelids. If there is no excess skin in the eyelids, then a brow lift may be recommended. However, if you do have extra skin in the upper eyelids and sagging eyebrows, your plastic surgeon may recommend both eyelid surgery and a brow lift. The best way to find out which procedure is right for you is by scheduling a personal consultation with Dr. Pearl or Dr. Ereso. Call our Mountain View office today at (650) 964-6690.